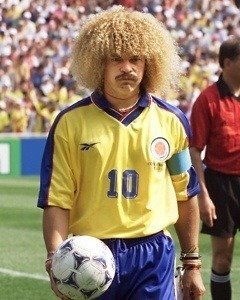 Although mostly remembered for his unfeasibly large blonde Afro, “the kid” was a gifted midfield schemer in his own right – known for his flamboyant playing style, numerous assists, and spectacular long range strikes. He was twice named South American player of the year, and played a huge role during the golden era of Colombian football during the 1990s, as they qualified for 3 successive World Cups. In 2004, he was included in the FIFA 100, a list of “greatest living footballers” chosen by Pelé to celebrate the 100th anniversary of FIFA. This entry was posted in Nostalgia, The World Cup. Bookmark the permalink.